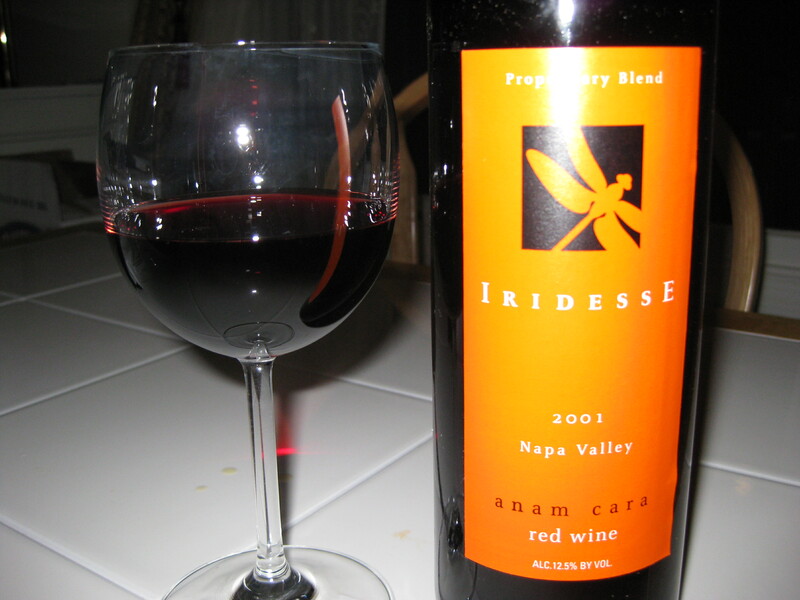 Last Spring, when Patrick and Genevieve visited DC, they were kind enough to leave a bottle of their 2001 Irisdesse Anam Cara Red Wine with us. The Anam Cara is a blend of 85% Sangiovese from Mount Veeder, Napa Valley, 10% Old Vine Zinfandel from Calistoga, Napa Valley, and 5% Cabernet Sauvignon from Calistoga, Napa Valley. 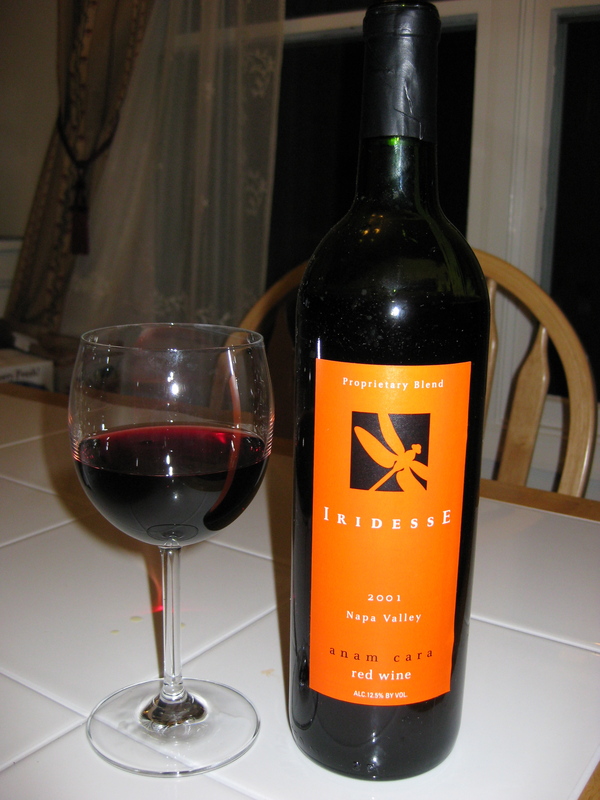 It had a real cork closure, clocked in at 12.5% alcohol by volume, and is available from Iridesse for $36. On the nose I found spicy cherry, spices, leather, tack room, earth, forest, cherry, mint, eucalyptus, strawberries, and raspberries. The nose smelled delicious. As is common in our house, Matt made his way well into his second glass before I even took my nose out of mine! You might think this is unfair, but you have to remember, he’s 6’5″ and outweighs me by quite a bit….2 glasses of wine for him is nothing compared to what it is for me! In the mouth I got flavors of tart red berries, fresh cherries…literally tasted as if I took a bite into a perfectly ripe cherry, strawberry, raspberry, and earth. Overall, the wine showed really well integrated tannins. With a low alcohol content, it didn’t have any heat on the nose or in the mouth at all. Even though the Cabernet Sauvignon is only 5% of this wine, I felt it really came through on both the nose and the mouth. It’s always amazing to me how the different elements of a blend add to the final product. Well-aged, and drinking perfectly, I’d love to have another bottle of this!